I wonder where the color scheme came from? Is it intuitive? Or based on perceptual factors? Black may be more appropriate (morbid as it may be) for death and perhaps yellow for allergies (reminds me of flowers). Sounds like a good study. The specifics are based both on historic precedent and the sign language of colors. Yellow, for falls, is commonly understood as a symbol for caution, whether by janitors mopping floors or by traffic engineers. 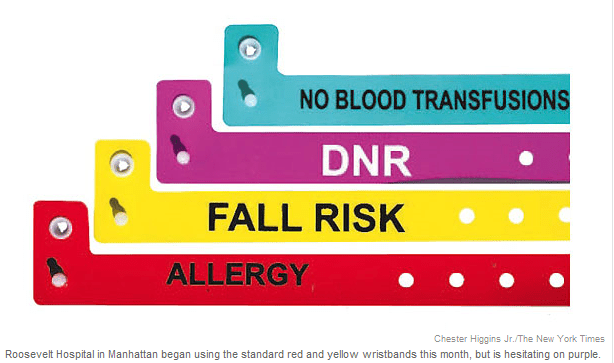 Red, for allergies, is associated with a command to stop and check for danger. In the past, some hospitals have used blue to signify D.N.R., but it was ruled out on a national level, Ms. Tena-Nelson said, because the phrase â€œCode Blue,â€ is often used to call for resuscitation, the opposite of what D.N.R. patients want.